Thursday January 19th, 2012 7 pm MST. At this class you will learn how to incorporate some graphics and embellishments to really dress up a calendar or storybook page. Create elegant pages. Make and use your own photos and backgrounds. Unrestricted layouts. Save money by printing at your favorite print facility. Many different page sizes and configurations to use. A fun way to preserve and share family history for all ages. 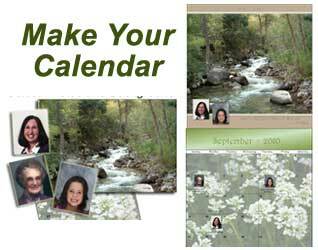 Make a beautiful calendar using your photos and graphics to commemorate birthdays, holidays, reunions and other events. Make large 12 X 12 or smaller calendars. An inexpensive way to print and share history with your children, grandchildren and relatives. Comes with Heritage Collector Suite.